All parts written, engineered, and produced by individual performers, final mixes by Brian John Mitchell except tracks 8 & 16 by Brian McKenzie. "For the past two years one of the primary facets of Electric Bird Noise has been the discordant chorded minimalist guitar jazz music for art galleries of Kind of Black, Birth, & Follow the Star & The Spider.The Christ Child...The Crow continues this series with chords fingered by spiders, plucked by crows, & built for The Christ Child. It's not a horror movie, it's a celebration!" "Vlor started as a short-lived moody pop band in 1992 & was revived as an acoustic shoegazing duo in 1997 releasing the EPs Lavished & Luxate before falling apart again in 1998. In 2006 the posthumous Sacred Places in the City was released & Vlor was relaunched as a group of musicians collaborating through the mail to record A Fire is Meant for Burning. 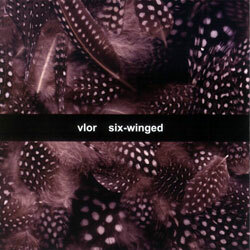 The new album, Six-Winged, is Vlor's second album as a collection of Silber all-stars working together. Six-Winged started with Brian John Mitchell (Remora/Small Life Form) recording guitars & bass lines & sending them out to friends to augment & complete. Returning with Mitchell (bass, guitar, vocals) to Vlor are Jon DeRosa of Aarktica (guitar), Jessica Bailiff (guitar, percussion, keyboard), & Paolo Messere of 6PM (guitar, bass, percussion, keyboard) to be joined by new members Annelies Monseré (guitar, cello, vocals, melodica, piano), Martin Newman of Plumerai & Goddakk (guitar), Mae Starr of Rollerball & Moodring (vocals), Jim DeJong of Infant Cycle (strings), Michael Walton of mwvm (guitar), Brian McKenzie of Electric Bird Noise & Something About Vampires And Sluts (guitar, bass, percussion), Michael Wood of Something About Vampires And Sluts & The Wet Teens (vocals), & Magen McAvenney (vocals). Yeah, we know, it's a ton of folks.